Butterflies love Zinnia flowers (and you will too!). 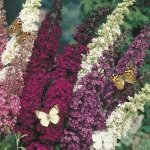 They are beautiful in any garden and are perfect for a butterfly garden. They add a variety of color to your garden......or focus on one shade or color and repeat it throughout the garden. Growing these beautiful annuals from seed is VERY EASY. To get the most out of these butterfly nectar plants, start the seeds inside about 6 weeks before the last frost date in your climate zone. This way there will be flowering plants earlier in your garden. Another option is to plant the seeds directly in your garden. Make sure and keep your transplants, seedlings or newly planted seeds moist until they are well-established. There are many varieties of this popular flower. My personal favorite is Z. Elegans (right)....sometimes called State Fair. This is a tall variety which the butterflies love. I also like the medium height variety Z. Lilliput (bottom left)....just because they are cute. Z. Profusion (bottom right) is a shorter variety I have used in pots. I have seen people plant a whole garden bed of these beautiful nectar flowers.....a real taste treat for the butterflies. I usually scatter them throughout the garden for little splashes of color. It might be nice to have groups of 3 or 5 plants clustered for more impact and to make it easy for the butterflies to find! Every butterfly garden plan should include this prolific bloomer. The large butterflies, Swallowtails and Monarchs, especially love these flowers. For continuous color, just pinch off the spent blossoms (they last a long time) and the plant will continue to produce flowers all summer. I would consider these flowers, along with Swamp Milkweed and Joe Pye Weed some of the top nectar flower plants in my garden.